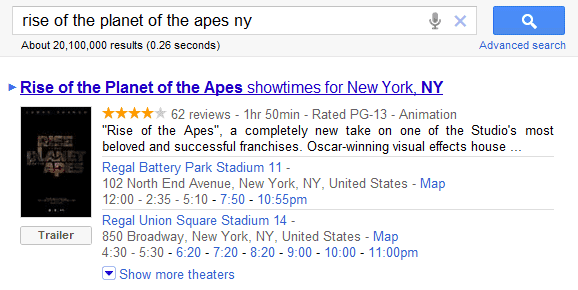 Google's OneBox for movie showtimes has a new interface that offers information about more movies. It's much easier to compare movies and you can click "show more movies" to expand the OneBox. Google links to the Google Movies site, which shows short snippets from reviews, trailers, small photos, but also links to IMDb. 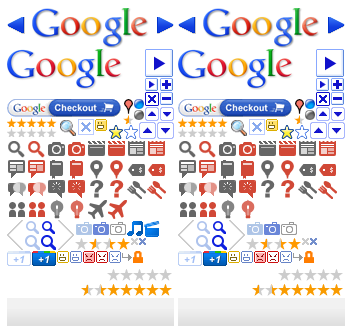 In other related news, François Beaufort spotted that the Google.com sprite, which includes all the images that are used in the search results pages, added 4 icons for flight search, music search and movie search. Back in March, TechCrunch noticed that the music search feature no longer worked. "The music search feature introduced in 2009 is currently unavailable while we make some updates to the user experience," explained Google. Still no indication of what movies are available with captioning, subtitles, or audio description? Does anyone know what the little gray arrow is for? Somehow I'm guessing for keyboard control of the sidebar (maybe for both search verticals and search options).